Offer price £6/kg when you order by 21/04/2019. Offer subject to availability. Maximum 20 promotional items per customer. 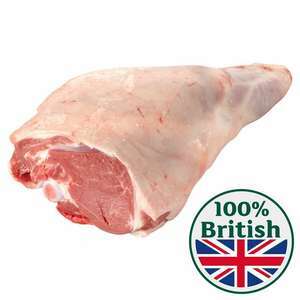 British lamb is all we should be buying. Importing it from New Zealand is …British lamb is all we should be buying. Importing it from New Zealand is crazy. Thanks but I'll make my own mind up where the lamb I buy is from, trying …Thanks but I'll make my own mind up where the lamb I buy is from, trying to dictate to people is crazy. You do that, the British farming industry and global warming should not be a concern to someone like you. It’s not dictating, it’s common sense. Ok. Lamb that was born, bred, raised, fed and slaughtered on British soil, is what we should buy and eat. British lamb is all we should be buying. Importing it from New Zealand is crazy. Thanks but I'll make my own mind up where the lamb I buy is from, trying to dictate to people is crazy. Obviously not to you. Have a pleasant morning. You do that, the British farming industry and global warming should not be …You do that, the British farming industry and global warming should not be a concern to someone like you. It’s not dictating, it’s common sense. Same should apply for the holidays. All this air traffic must be causing great harm?
? Why not to me?? I'm sure someone on one of the other threads about legs of lamb produced evidence that there less impact on global warming importing lamb from New Zealand compared with using British lamb. Regarding being concerned about global warming, my conscience is clear. I work just a few miles from home compared to a neighbour who travels 20 miles to work. I'll off set my choice of lamb with the reduced cardbon I produce whilst commuting. Not British though! I’m yet to have had a non grissly New Zealand leg of lamb unless I’ve been unlucky! Same should apply for the holidays. All this air traffic must be causing …Same should apply for the holidays. All this air traffic must be causing great harm? It probably is, but I’m just talking about what we can do individually. I’m sure you don’t fly to New Zealand very often. We have more than enough British reared meat, this is about government greed. Support British farms and our own industries in general whenever possible I say. Because you questioned it. If you question something, it’s because the answer is not obvious to you. However, most people already know why it’s not good to import meat, or at least they have the use of google, which I’m assuming you also have. I'm sure someone on one of the other threads about legs of lamb produced …I'm sure someone on one of the other threads about legs of lamb produced evidence that there less impact on global warming importing lamb from New Zealand compared with using British lamb.Regarding being concerned about global warming, my conscience is clear. I work just a few miles from home compared to a neighbour who travels 20 miles to work. I'll off set my choice of lamb with the reduced cardbon I produce whilst commuting. No evidence that was independent, just what the government want you to read. Also, it’s not just about global warming, as China will single handedly cause that, it’s about keeping money in Britain and supporting our own industries. On a more logical note, the closer the meat is to your plate, the fresher it will be. How long do you think it takes to get here from New Zealand. Because you questioned it. If you question something, it’s because the a …Because you questioned it. If you question something, it’s because the answer is not obvious to you. However, most people already know why it’s not good to import meat, or at least they have the use of google, which I’m assuming you also have. It's not good to import meat? Nice try. Enjoy your day. Best leg of lamb I ever had was one I bought in Morrisons... And it was from Australia. Sadly I've not seen any since. ?? I am very confused. As an example, the Irish rely on meat exports to the UK, as far as Google can tell me. I'm unclear on NZ. I refuse to purchase frozen fish from Iceland which has been packed in China. Same with NZ lamb. In fact I only buy British meat and fish apart from Tinned Tuna, Salmon, Mackerel, Sardines,and anchovies. Ok. I give up. It’s Monday morning. Good luck. No evidence that was independent, just what the government want you to …No evidence that was independent, just what the government want you to read. Also, it’s not just about global warming, as China will single handedly cause that, it’s about keeping money in Britain and supporting our own industries. On a more logical note, the closer the meat is to your plate, the fresher it will be. How long do you think it takes to get here from New Zealand. Genuine couple of questions then and I'm prepared to be educated; is there enough British lamb to go round if everyone bought British without the prices escalating due to more demand? and are farmers currently struggling to sell all their lamb and that's why you want me to buy British? Regarding the freshness I'm presuming its frozen when sent across the world so I've not noticed any issues with that at all. Ok. Lamb that was born, bred, raised, fed and slaughtered on British soil, …Ok. Lamb that was born, bred, raised, fed and slaughtered on British soil, is what we should buy and eat. There's always one on here coldpop best to ignore. Hi, it's not mock as I have same question. This will escalate the prices and lamb meat will become unaffordable for lots of people. Hi, it's not mock as I have same question. This will escalate the prices …Hi, it's not mock as I have same question. This will escalate the prices and lamb meat will become unaffordable for lots of people. A short term escalation. People need to look at the bigger picture. Also, if lamb is temporarily more expensive, there’ll inevitably be cheaper meats or cuts. Once British farming is back to where it was, the meat will come down in price as the farms and butchers will have the numbers and profits to compete. We used to have a local butchers in every other street in my town, and a grocer and a baker and a few fishmongers. Now we have all but killed that in preference to cheaper, frozen, heavily processed or full of preservatives alternatives. Thusly, the rise in food related illnesses and cancer has soared. If you want to know how best to shop and eat, look at the war generation. My Nan is 92, still fighting fit. You’ll never see her eat out of a packet. I agree, money is a concern for many, but realistically, you’re not going to see people on benefits arguing the price of lamb. If we start to shop small, often and locally and make meals freshly, we can regenerate small UK businesses. If we buy in bulk from overseas and use big supermarkets for big buys, we will not see any improvement both health wise or economically. I realise it’s a big ask, I have two small children and time and money is very tight, but if none of us try to at least make small changes, who will? Guys, however you may try to spin it, flying a heavy water-based product 11,500 miles across the world when we have excellent quality lamb on our doorstep is objectively ****ing crazy and no counter-argument can stand up to that fact. We have more than enough British reared meat, this is about government …We have more than enough British reared meat, this is about government greed. Really? Which government? Ours? How do they benefit? Why do you think it's not down to simple economics? Really? Which government? Ours? How do they benefit? Why do you think it's …Really? Which government? Ours? How do they benefit? Why do you think it's not down to simple economics? NZ government giving certain U.K. politicians envelopes under the table. That's a ridiculous allegation. For a start, trade deals aren't negotiated by the U.K. they're negotiated by the EU. And the best they get offered is no tariffs on a certain quota of imports. It's not like there's a subsidy for NZ lamb. Now if NZ can ship their lamb to the EU cheaper than the Welsh farmers can supply it, that's simple economics. That's a ridiculous allegation. For a start, trade deals aren't negotiated …That's a ridiculous allegation. For a start, trade deals aren't negotiated by the U.K. they're negotiated by the EU. And the best they get offered is no tariffs on a certain quota of imports. It's not like there's a subsidy for NZ lamb. Now if NZ can ship their lamb to the EU cheaper than the Welsh farmers can supply it, that's simple economics. If only it was £5 a kilo, 2kg NZ leg at Tesco = £11 whilst fresh uk lamb leg = £11 a kilo. If only it was £5 a kilo, 2kg NZ leg at Tesco = £11 whilst fresh uk lamb …If only it was £5 a kilo, 2kg NZ leg at Tesco = £11 whilst fresh uk lamb leg = £11 a kilo. Regarding the actual post...Thanks for posting, OP! Also available for £5.75 from Tesco. If you're after a cheap joint, Tesco Counter Btitish Pork leg is only £2 per kilo, ends today...or get 3 large British chickens for £10 until 7/5/2019. Let me guess - each store is only getting sent a small number of joints each day and they are sold within a few minutes of being put on the shelf?